a hell LOVE a town: Is a Hot Dog a Sandwich? Crif Dogs is an East Village staple, on the storied St. Mark's Place. It may be just as well known for being the "secret" entrance to the speakeasy, Please Don't Tell, as it is for its hot dogs. Everyone has already told, and the speakeasy is *the* spot for first dates if you are 23, but I always preferred the dogs. At Crif Dogs, you can order a hot dog with cream cheese, styled like a Philadelphia cheesesteak, over a fried egg, or a dozen other options with a variety of toppings. My favorite, pictured above, is the Chihuahua - a hot dog wrapped in bacon with avocado and sour cream. I've wrapped up many a night out with a trip to Crif Dogs, a Chihuahua, an order of cheese fries, and me asking people if they've made reservations there as they walk in. Hilarity always sometimes ensues. When I visited Kristyn in Chicago earlier this fall, one of the top things on my to-do list was to try a Chicago-style hot dog. In our quick research after our Chicago Food Planet tour, we decided Portillo's was the dog to go for. I loved how the place was decorated, as it reminded me a little of a Disney World ride, with fake exteriors of houses and creepy fake townspeople doing their thing in the rafters. I loved Portillo's. One, because I got a full meal - a hot dog, fries, and a soda - for around $5. Two, because that full meal was awesome. The Portillo hot dog is topped with what feels like a full salad - mustard, relish, freshly chopped onions, sliced red ripe tomatoes, kosher pickle, and sport peppers - all on a soft steamed poppy seed bun. Copenhagen Street Dog is quick to point out, as their motto says, "It's not a hot dog. It's a pølse," but I'm including them in this post because their dog is delicious and I do what I want. I was just introduced to this dish this week when I attended an Edible Brooklyn event at Brooklyn Brewery called, "How to Prepare a Nordic Feast." 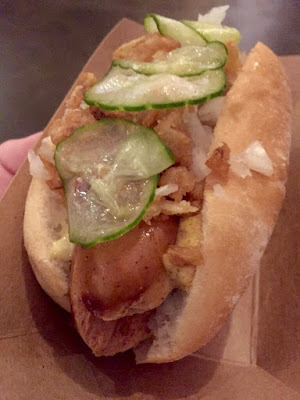 The folks from Revolving Dansk brought the Copenhagen Street Dog to Brooklyn and were at the event with their story and samples of their pølse. Pølse is a smoked sausage housed in a bun just like the American hot dog, but the edges of the sausage hang out of the bun like it's a smile. Toppings are: ketchup mixed with applesauce, spicy mustard, a remoulade sauce made of cauliflower, celery, carrots, and curry, raw *and* fried onions, and pickles. What I liked best about this presentation aside from the taste of that dog was that the folks from Revolving Dansk held up the microphone to the pølse as they snapped it in half so we could hear it. The snap is very important in the pølse, which is all-natural and all-locally-sourced-pig. Copenhagen Street Dogs are currently on the menu at Park Luncheonette in Brooklyn, at Scandinavian Butik in Connecticut, at events around NYC, and available online. I need to get myself to Copenhagen to try this street food on the proper street. Is a hot dog a sandwich? The world may never know, but does the world really care? Let's just continue to create different versions of this dish. I think we will all be fine. After all, a hot dog by any other name would taste as juicy.